A statue of Venus was finally hoisted atop the Trinity Apartments in San Francisco Monday morning, making the 92-foot sculpture the tallest in the city. The statue is the centerpiece of a public art-filled piazza in the heart of the apartment complex at Eighth Street between Market and Mission streets. The massive, stainless-steel sculpture, which is slightly shorter than the Statue of Liberty, is part of a collection designed by renowned artist Lawrence Argent. The statue means a lot to Yvonne Sangiacomo, whose late husband, Angelo, was the developer of the apartment complex that commissioned the Venus statue. Sangiacomo arrived in a construction hat and wheelchair to witness the feat. She wiped a tear as crews hoisted the stainless steel face on top of the roof. "He used to always say it would be beyond his imagination how beautiful it was," said Mia Sangiacomo, co-owner of the Trinity Place. "He'd be surprised that a little Italian guy who flunked kindergarten and lived in his living room until he was 34 could create so much. He was a very humble man. And I think he would've surprised himself how much he did." 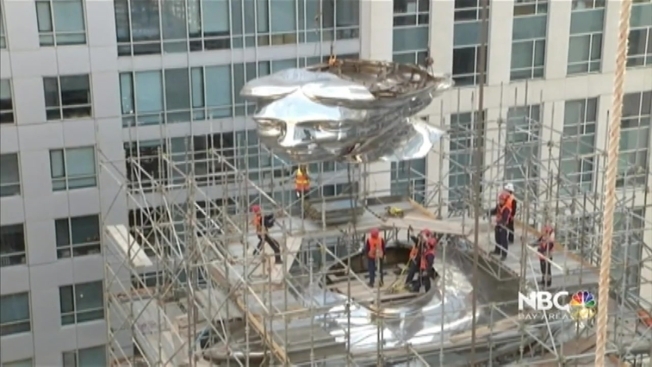 Her husband asked a Denver artist to work with a company in China to put the stainless steel statue together; it arrived in San Francisco in 70 pieces. Then it was welded and bolted into 11 stacks, placed on top of each other. Venus is now the centerpiece of what builders are calling 'Piazza Angelo' at the apartments, a plaza that is quite popular in Italy. "Call it spiritual, call it whatever," co-owner Jim Sangiacomo said. "He trusted the artist to do something really outstanding." "I'm very proud of my dad," Mia Sangiacomo said. "Very proud. I miss him. He did a great job. Great job dad."